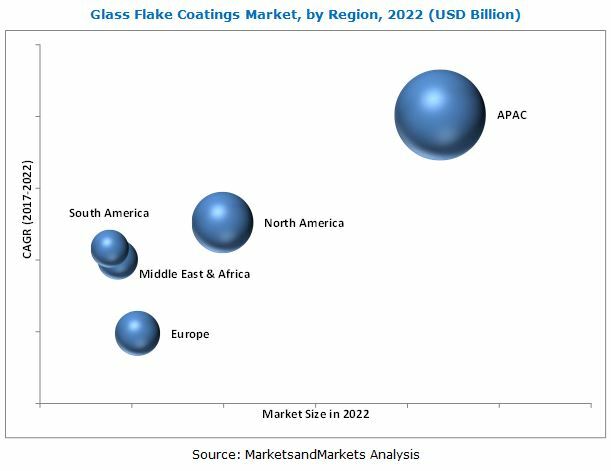 [136 Pages Report] glass flake coatings market was valued at USD 1.38 Billion in 2016 and is projected to reach USD 1.80 Billion by 2022, at a CAGR of 4.48% during the forecast period. The forecast period considered is from 2017 to 2022, while the base year considered to estimate market size is 2016. This report aims to estimate the size and growth of the glass flake coating market across different segments, such as resin, substrate, end-use industry, and region. It analyzes the opportunities in the market for stakeholders and presents a competitive landscape for market leaders. Factors such as drivers, restraints, opportunities, and industry-specific challenges influencing market growth have also been studied in this report. The top-down and bottom-up approaches were used to estimate and validate the size of the global glass flake coating market and other dependent submarkets. This research study involved the extensive use of secondary sources, directories, and databases, such as Hoovers, Bloomberg, Chemical Weekly, Factiva, related associations/institutes, and other government associations. Public as well as private company websites were also used to identify and collect information useful for a technical, market-oriented, and commercial study of the global glass flake coatings market. After arriving at the total market size, the overall market was split into several segments and subsegments. 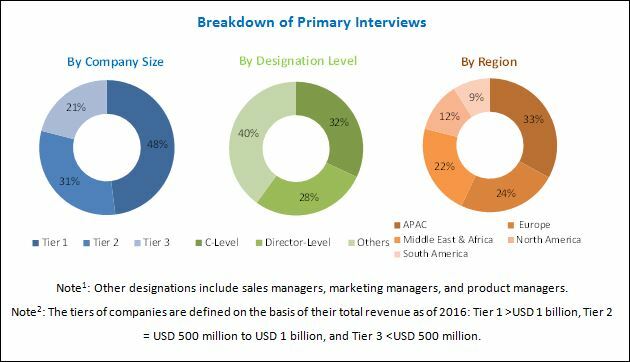 The figure given below provides a breakdown of the primaries conducted during the research study based on company type, designation, and region. Key manufacturers of glass flake coatings include Akzo Nobel (Netherlands), PPG Industries (US), Jotun (Norway), Hempel (Denmark), Chugoku Marine (Japan), The Sherwin-Williams Company (US), KCC Corporation (South Korea), Nippon Paint (Japan), Kansai Paint (Japan), and RPM International (US). This research report categorizes the global glass flake coatings market based on resin, substrate, end-use industry, and region. The global glass flake coatings market is estimated to be USD 1.44 Billion in 2017 and is projected to reach USD 1.80 Billion by 2022, at a CAGR of 4.48% from 2017 to 2022. The growing demand for advanced and high-performance coatings to protect tanks, pipelines, and onshore & offshore infrastructures made of steel and concrete has led to an increase in the demand for glass flake coatings from the marine industry. Based on resin, the epoxy segment is expected to witness the highest growth during the forecast period. The growth of this segment can be attributed to the increase in the use of epoxy-based glass flake coatings in tank lining, pipe coating, and ballast tank coating. Upcoming and ongoing oil & gas projects will also use epoxy-based glass flake coatings, further driving the market. Based on substrate, the steel segment is projected to witness the highest growth during the forecast period. The increase in the use of glass flake coatings to coat the steel used in the building of large and medium ships, offshore & onshore platforms, storage tanks, and pipelines is a major factor driving the growth of this segment. Glass flake coatings reduce the effects of the abrasive & corrosive environments steel substrates are mostly used in, thereby increasing their durability. Based on end-use industry, the marine segment is projected to witness the highest growth during the forecast period. The increase in global trading has forced the marine industry to invest in various shipbuilding projects. These projects have increased the demand for novel coating solutions for the protection of marine vessels and structures from corrosion, fouling, abrasion, salt water, air, and UV degradation. The Asia Pacific glass flake coatings market is projected to witness the highest growth from 2017 to 2022, in terms of value and volume. Manufacturers of glass flake coatings are targeting this region as the shipbuilding and chemical industries in the region are the largest. The China glass flake coating market has grown rapidly in recent years and is projected to witness high growth in the near future, due to a large number of established shipbuilding and chemical industries in the country. Countries such as India, Indonesia, and Australia are making significant developments in marine and chemical & petrochemical projects, which is anticipated to propel the growth of the glass flake coatings market in these countries. The growth of the glass flake coatings market may be restrained by the slow growth of the industrial sector in Europe. This slow growth is due to the decline in the chemical & petrochemical and marine industries in the region. Companies such as Akzo Nobel (Netherlands), PPG Industries (US), Jotun (Norway), Hempel (Denmark), Chugoku Marine (Japan), The Sherwin-Williams Company (US), KCC Corporation (South Korea), Nippon Paint (Japan), Kansai Paint (Japan), and RPM International (US) are key players in the global glass flake coating market. Diverse product portfolios, strategically-positioned R&D centers, adoption of varied development strategies, and technological advancements are some of the factors that have helped these companies strengthen their position in the glass flake coatings market. These players have been adopting various organic and inorganic strategies to achieve growth in the glass flake coatings market.